Good Friday morning my fellow stampers. WOW! It’s Friday already. Does anyone have fun plans for the weekend? For today I have another masculine card for you. I’ve told you before how much I struggle with them. I’ve actually come up with a few in the past couple weeks. I used the Stampin’ Up Life Is Grand Stamp Set. I love how t does the shading for you when you stamp. Here’s my card for you. I started with an Old Olive card front and ran it through my Big Shot using the Pinewood Planks Dynamic Textured Impressions Embossing Folder. 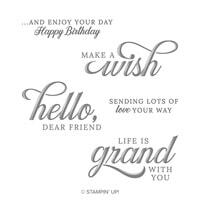 I stamped the ‘Make A Wish’ from the Life Is Grand stamp set in Old Olive Ink on a small piece of Whisper White cardstock. 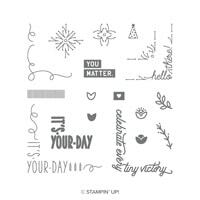 I stamped the streamers from the Stampin’ Up Around The Corner Stamp Set in Night of Navy Ink around the sentiment. 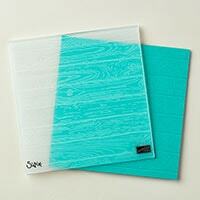 I adhered the Whisper White panel to a Smoky Slate mat using Snail. I adhered the matted sentiment to the card front, using Multipurpose Liquid Glue, on an angle so that it over hung on both sides of the card front. I cut off the excess from each side using my Paper Snips. I adhered the card front to a Night of Navy card base using Multipurpose Liquid Glue. On the inside Whisper White panel I stamped the sentiment from the Life Is Grand stamp set in Old Olive Ink. I stamped the corner streamers from the Around The Corner stamp set in Night of Navy Ink. I adhered the Whisper White panel to the inside of the Night of Navy card base using Snail. 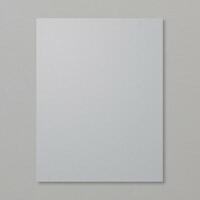 I adhered a strip of Smoky Slate cardstock to a Whisper White mat using Snail and adhered it to the bottom of the card base using Multipurpose Liquid Glue. To finish my card I decorated a Medium Whisper White Envelope. I stamped the corner streamers from the Around The Corner stamp set on the front of the envelope and the envelope flap. This entry was posted in Birthday, Clean & Simple, Masculine, Quick and Easy by ksenzak1. Bookmark the permalink. Love how you put the sentiment on an angle. Perfect masculine card.